First Watch Sarasota Half Marathon #2! 1. I did it, again! When I do something I've never done before, such as run 13.1 miles for the first time, I sometimes think it may have been a fluke or a once-in-a-lifetime experience. This race proves that untrue. I really can do this! 2. This half was harder than the first. I feel like it should have been just the opposite, but for some reason, it was tougher this time around. I'm assuming that was because of a combination of factors. It was warmer this year, working a night schedule I'm not used to waking up at 5 a.m. and running at 7 a.m., and because of that, I didn't sleep well the night before. Last year when I was working mornings, I had plenty of time in the afternoons to do my training runs; this year all of training had to be done before work. That meant some days my runs had to be cut a little short for time purposes. Also, I lacked that rush of adrenaline that comes with running a certain race or distance for the first time. 3. I ran this half a few minutes slower than my first. I think most of the above factors affected my time as well. I'm not a very fast runner, so time is not my top priority. But I am competitive with myself, so I would have at least liked to have tied my previous time. 4. I should have included more strength training in my program. Last year, I did way too much in addition to my running training plan. I was still going to my spin classes, lifting classes and cardio classes. Most of my rest days weren't really restful, and my back was a wreck because of it. I have a torn disc, and I wasn't careful enough. This year, I had a very busy few months with work, events and other obligations, so I had very little time for strength training. My legs felt a little weaker during training and the race, so next time I'm going to make strength exercises a priority. 5. I need to better strategize my bathroom breaks. The race was sold out this year, so it was packed! The lines for the port-o-potties were really, really long before the race, so I decided to wait to go until I was on the course. I hedged my bets that stopping at the first set of port-o-potties was the best choice. My thought was more people would need to go as the race went on, so the lines could be longer later on. I don't think that was really the case, and I lost a good seven minutes or so waiting in line! 6. Having your own cheering section, no matter how small, is awesome! After working late, Max got up early to be there at the finish line. He also had a brunch to emcee that morning, but he made sure to be there to take some photos and cheer me on. Knowing someone is waiting a the finish line gives you even more of a reason to get there. 7. Buying a second iPod Shuffle was definitely worth it. I run with my iPhone in an armband during training runs, but it's a little restrictive and not all that comfortable. I prefer the Shuffle. Last year I thought I had calculated correctly that my Shuffle battery would last through the whole race - wrong! Either that, or it wasn't charged fully. I had to run a few miles of the race without music. Doable, but awful. This year I wasn't taking any chances; I ran with two iPods. I didn't love spending an extra $46, but you can't put a price on the power of music to get you through the pain. 8. Prayer helps, so does doing The Dougie. Speaking of the power of music, the final two songs that came on my iPod at the end of the race were Josh Groban's version of "Ave Maria" and "Teach me How to Dougie." Interesting combination. The last few miles were getting extremely tough. It was divine intervention in the strangest way. I prayed my way through "Ave Maria" and then did a modified Dougie as I was running. I caught a few spectators smiling and laughing (in a good way...I think). The last mile was fun and that's all that matters! 9. How do people run a race without sweating?! I was completely drenched, and I looked around at the post-race party to see people who looked like they had barely sweat at all. I don't get it. 10. Beer before 10 a.m. tastes pretty darn good after 13.1 miles. Thank you, Michelob Ultra beer garden! 11. No matter how time consuming the training, how tough the race, and how sore my body is, two minutes after the race, I was ready to do it all over again! 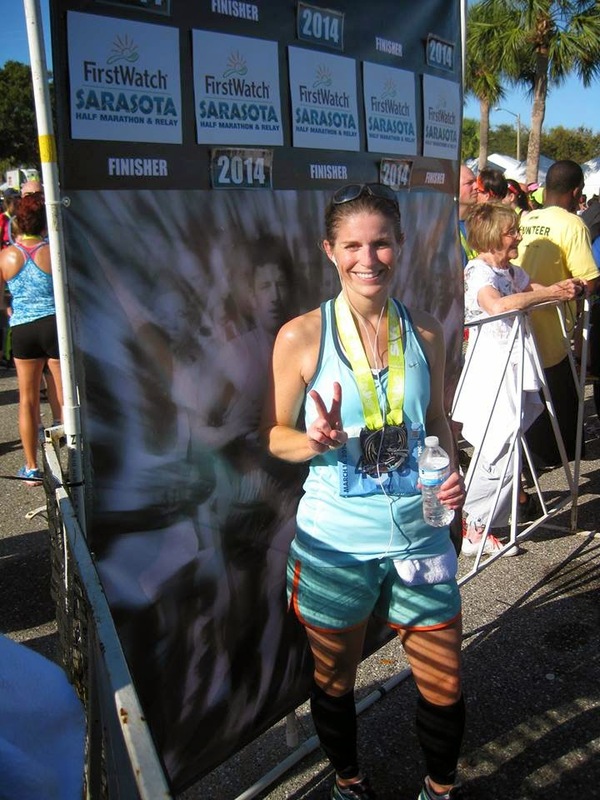 I won't be able to run the Sarasota Half next year because of my wedding/honeymoon. Not a bad reason to have to miss it! But I've already looked up several halfs in other areas. 13. Celebrate YOUR accomplishments. There's a lot of what you might call fitness snobbery or exercise elitism out there. Women's Health Magazine ran a story about it in a recent issue. It's truly worth a full blog post in the future, because I find it so discouraging. With ultrarunning and Ironmans, a half marathon can seem like not much at all...if you let it. I champion anyone striving to reach fitness goals or just trying to live a healthier lifestyle. Whether it's your first 5K or your 20th marathon, it's worthy of celebration! You can totally do a full! All it takes is more time to train. Love this blog!!! I am trying to get ready for a race myself! Such motivation! Thank you :) Good luck - it's so worth it in the end!